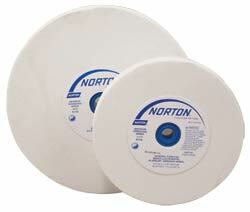 These Norton White Aluminum Oxide grinding wheels will grind cooler than the grey wheels that normally come with grinders The wheels are a "J" hardness, and friable, so the worn cutting particles are released from the wheel, exposing fresh ones. This action is very useful when grinding harder metals like high speed steels used in turning tools. White aluminum oxide wheels will make your grinder more "user friendly" and will put a sharper edge on your turning tools. We offer 60 grit wheels for easier shaping of tools and 100 grit for general sharpening while turning. All the wheels have a 1" bore and are bushed to fit the grinder arbor sizes listed below. These wheels can be used with the Oneway Balancing System. The 6" White Wheels are bushed to fit 3/4", 5/8" and 1/2" arbors. The 8" White Wheels are bushed to fit 3/4" and 5/8" arbors.